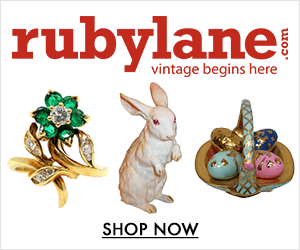 Held annually on the third weekend of September (one day only), this gigantic garage sale is dedicated to every enthusiast who specifically seeks out old wooden toys, clothing, old coins, stamps, rare decorative objects and even fashion accessories. 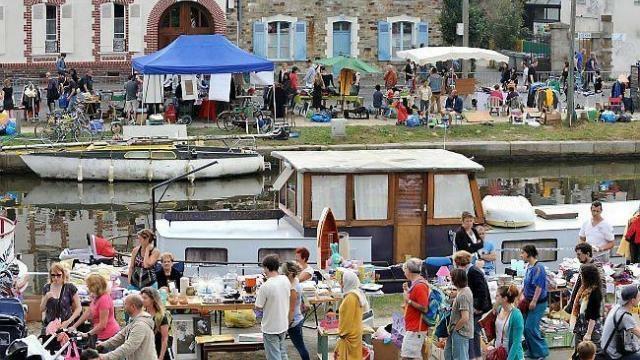 Taking place along the Canal Saint-Martin in Rennes, the event also offers flea market enthusiasts a nice stroll along the river. Considered a true cave of Ali Baba by flea market enthusiasts, the Rendez-vous international de la Curiosité et de la Brocante de Durtal (Durtal International Flea Market Fair, also known as Brocante de Durtal) gathers around 450 flea market exhibitors and 20,000 bargain hunters from nearby regions. Spreading along the walls of the city’s castle, Durtal flea market fair is famous for the freshness, abundance and quality of its merchandise. No wonder why this event nowadays has an international dimension! 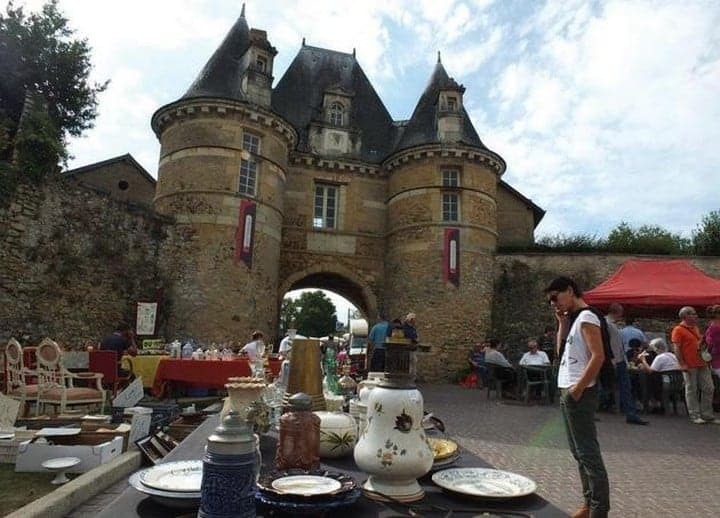 The Rendez-vous international de la Curiosité et de la Brocante de Durtal is one of the last outdoor antiques fair of this scale and quality in western France, and one of the few remaining in the country. For 14 hours, the village of Durtal becomes a veritable open-air museum: rare coins, old books, silverware, crockery, old clothes, jewelry, ceramic, porcelain, furniture and paintings share the limelight with other anecdotal objects, and the fair’s antique spirit smoothly blends within the historic setting surrounding the castle. 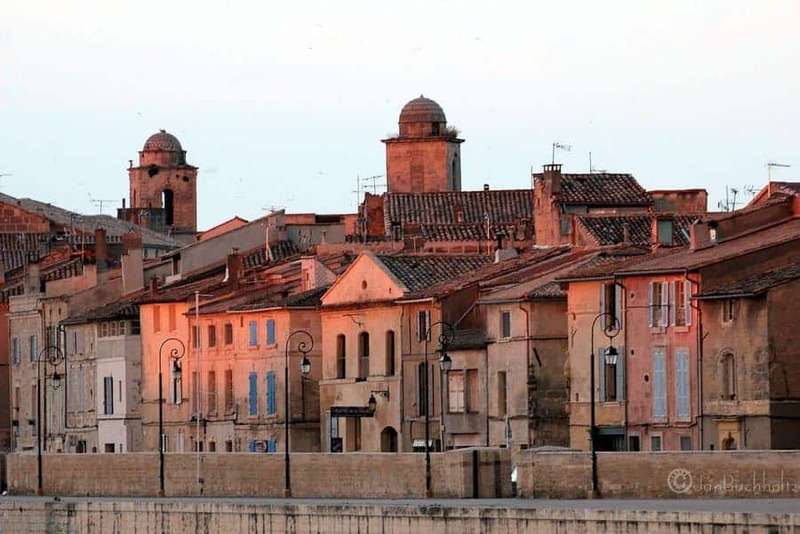 Collectors and professionals, connoisseurs and novices all flock to Durtal once a year to find the rare gem, a great bargain, or to harvest the best antiques for their clients. The flea market at Château de Chambord (Grande Brocante de Chambord) is certainly one of the most scenic and majestic places to go antiques shopping in France. 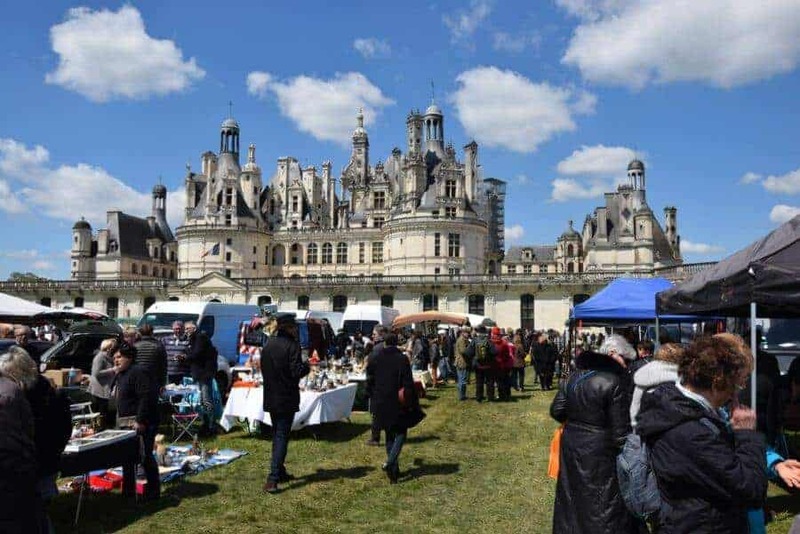 This May Day flea market is held in the streets of the village and on the southern parterre of the Chambord castle, the largest of all Loire Valley castles. 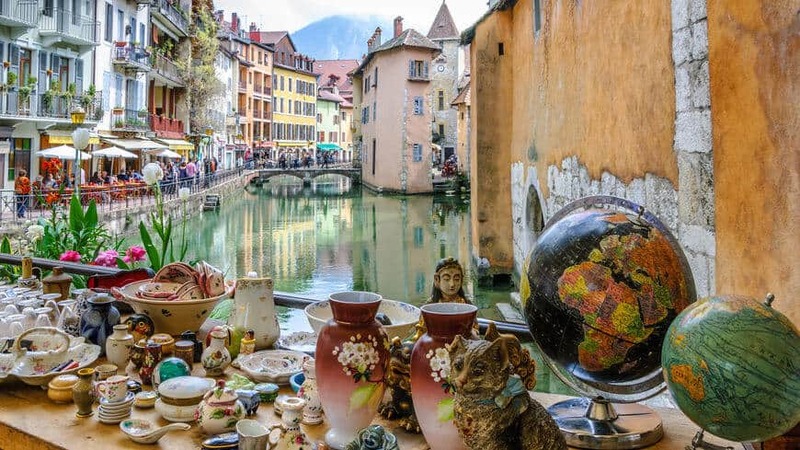 Over 50,000 visitors and nearly 500 exhibitors from all over France and from various European countries attend this huge brocante, which spreads over more than five kilometers of alleys. 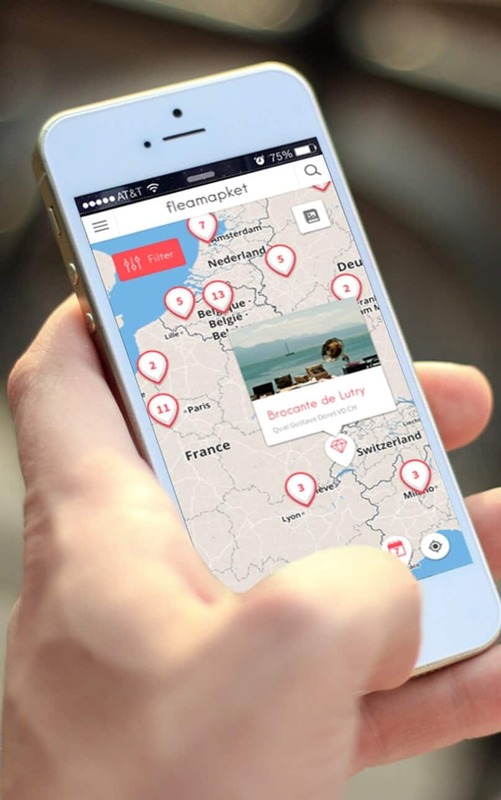 Visitors will find a great diversity in styles and tastes at Chambord’s flea market. 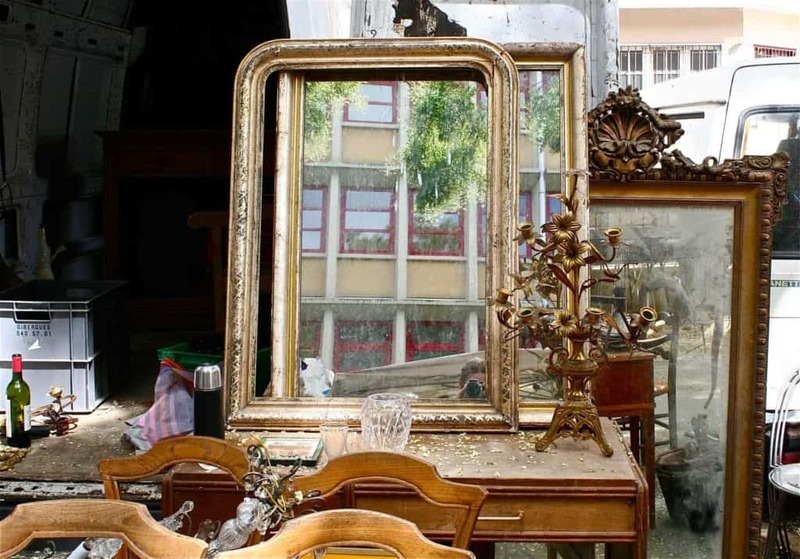 From Antique furniture and heirloom-quality oil paintings to gramophones, kitchenware, antique tools, vintage clothing, phonographs, antique cameras and other knick-knacks, this flea market is a paradise for bargain hunters and antiques lovers. Competitive pricing makes the effort of driving the 106 miles (170 kilometers) from Paris all the more seductive. 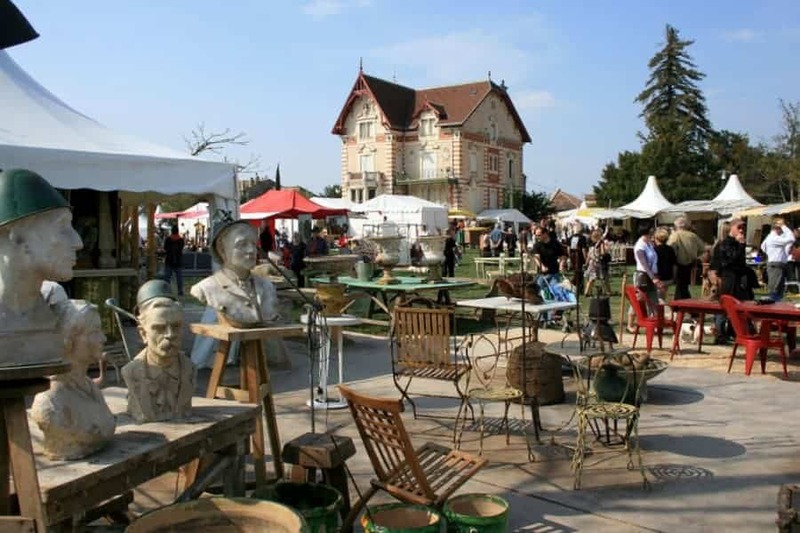 The city of Tours, known as the ”Garden of France”, hosts a brilliant monthly flea market with around 150 stalls showcasing fine French porcelain, books, furniture, antique bottles and charming old agricultural equipment. 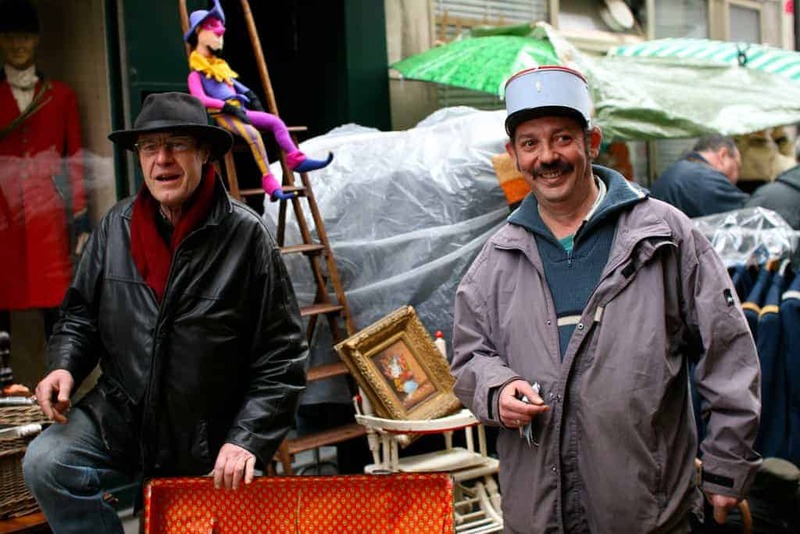 Set along the rue Béranger, the Brocante Béranger takes place on the 4th Sunday of the month, all year long (except December), from 8 am to 6 pm. Only professional antique dealers are allowed to sell their merchandise on the premises of the flea market, which somewhat guarantees the quality of the items sold at this brocante. Tours is easy to reach by rail – just over an hour from Paris on a high-speed TGV, so it’s perfectly possible to visit the Boulevard Béranger market on a day trip. However, it’s well worth spending a few days in delightful Tours to explore the wonderful architecture, botanical gardens and vineyards. 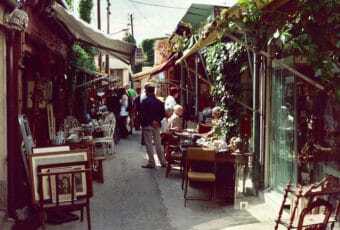 The 120-stalls strong weekly flea market of the Place Viarme is a brilliant place to unearth all kinds of antiques, curios and collectibles. Nantes’ stunning location on the rugged coast of Brittany means it is easy to unearth some vintage or quirky nauticalia, alongside more usual flea market finds like books and postcards, pottery and porcelain, as well as local Quimper ceramics. 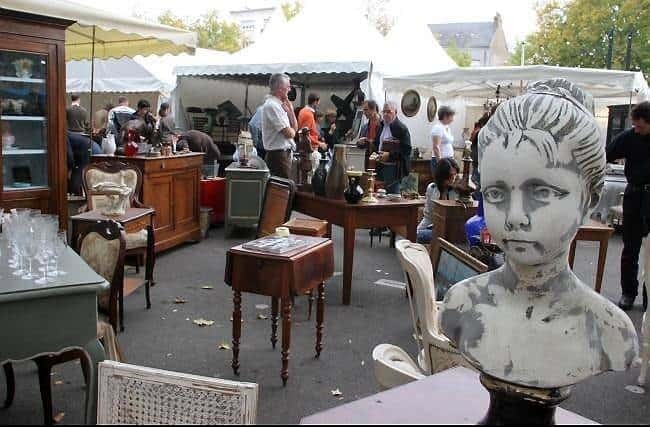 In addition to its weekly flea market, the city of Nantes also hosts a bi-annual antique fair on the Place Viarme. Generally held in early May (spring edition) and on the last weekend of September or early October, the Grande Brocante d’Automne de la Place Viarme gathers more than 160 professionals antique dealers selling a large variety of antique merchandises and vintage garments: antique furniture, crockery, china, glassware, silverware, laces, embroidery, postcards, dishes, paintings, and much more. Place Viarme is easily reached by taking Tram 1 to Commerce then changing to Tram 3 for the Viarme-Talensac stop. The tram departs from right outside the train station.